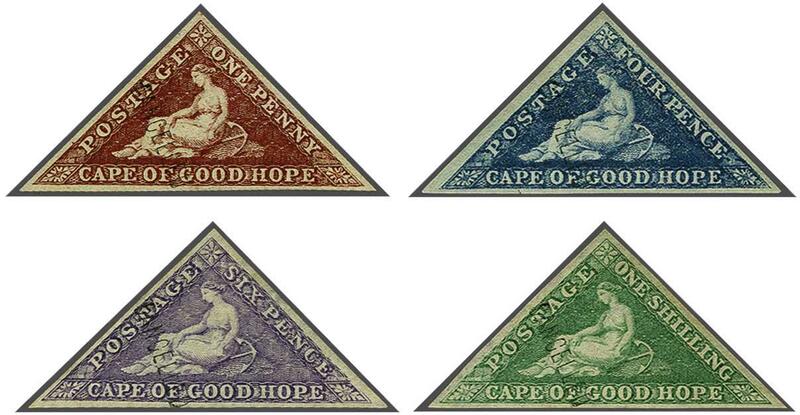 De La Rue Printing 1863/64: 1 d. deep carmine-red, 4 d. blue, 6 d. bright mauve and 1 s. bright emerald-green; the set of four values, all with fine even margins all round, each overprinted CANCELLED reading down in black. Fresh and very fine with large part og, An extremely rare set.rnrnProvenance: Collection 'Maximus', Sothebys, Sep 1989, lot 84.rn Collection 'Table Mountain', Cavendish, June 2001. TO BE CONFIRMED.